In 1970, Swami Rama, who was raised in the Himalayan caves and since the age of three had trained in the closely guarded secrets of yoga, walked into an American research laboratory. Under the most rigorous experimental conditions, he simulated death by virtually stopping his brainwaves and heartbeat, and yet remained fully conscious of events occurring around him in the laboratory. His breathing abilities stunned the Western scientific establishment. His book Science of Breath is an introduction to how yogis regulate Prana (the Sanskrit word for life force of life energy) through the science of breath written in terms a Westerner can understand by Swami Rama, and two respected American physicians. The book shows a thorough understanding of the breath, in that it is a powerful tool for expanding our awareness of the various dimensions of the body and mind. Breathing is unique as a physiological function because feedback signals from the lungs and from oxygen and carbon dioxide in the blood offset the rate and depth of breathing, and yet the act of breathing itself is an act of voluntary muscles. Without oxygen, the body cannot burn food and generate energy. The scientific world has focused mainly on breath from the physical aspect, but our own personal experiences highlight the relationship between emotions and breath. A common example is the sob of grief or the trembling breath of anger. Physical influences, such as pain and exercise, can act to change both the breath and emotional state of mind. Fear causes us to tighten up, take short breaths and speed up the heart rate. Western medicine tends to differentiate between the physical, as studied by the physicians (medical doctors), and the mental as studied by psychiatrists. 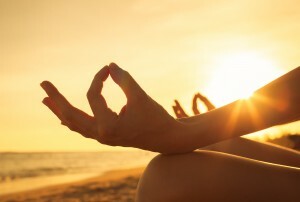 In the East, and in particular amongst the practitioners of medicine and yoga, the relationship between the body and mind has been thoroughly explored and they have found the intermediate link is primarily connected to energy. Svarodaya in Sanskrit means the science of breath. Breathing is the one physical function, which is both involuntary and voluntary. The Indian inner explorers understood this, and realized that breath is the key to control over the autonomic nervous system. By learning to manipulate their breathing patterns, yogis gained control over their brain function. “The physiological stress response is actually designed to be an asset. It speeds the heart rate and diverts blood away from the gut and to the muscles so we can run away. It constricts the pupils of our eyes so we can focus on our attacker. It dilates the bronchi of the lungs to increase blood oxygenation, and converts energy stored in the liver into fuel for strength and stamina. In short, it keeps us safe,” says Dr. Esther Sternberg, physician and author of several books on stress and healing. This is why stress is one of the main contributors to the three biggest killers in Western society, heart disease, cancer, and diabetes. Stress hormones make the adrenal glands release another hormone called cortisol. Cortisone, which is the drug form of the hormone cortisol, is one of the most powerful anti-inflammatory drugs available. “What’s happening when you’re stressed is that your own body is giving itself multiple shots of that anti-inflammatory hormone, and so that tunes down your immune system’s ability to do its job to fight infection,” Sternberg says. Left unchecked, there is a possibility that stress will kill you. The pressures of everyday responsibilities at work can trigger stress and at home so, if you are in a high-powered job or position that comes with more responsibility, this very likely leads to increased levels of stress. Therefore the more financially successful in life you are, the more likely you are to be dealing with highly stressful situations on a regular basis. Controlling the tempo of our breathing helps control the state of mind in times of stress. That’s when the body’s natural “fight or flight” response quickens the rate of breathing and causes panic and stress in both body and mind. When we are scared, or in a state of stress, our shoulders tighten, causing even more tension, and our heartbeat races. If we can maintain an even, steady breath, this slows the heart rate, relaxes the body, calms the mind and supplies the brain with enough oxygen to make wise decisions. Scientific studies have shown that controlling your breath can help manage stress and stress-related conditions. 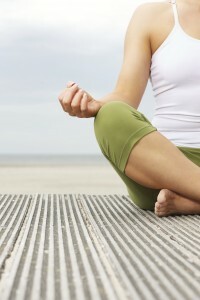 Breath control is also used in practices such as yoga, tai chi and some forms of meditation. Many people use their breathing to help promote relaxation and reduce stress. Every morning I wake up at 4:50 a.m. and begin my day with 10 minutes of breathing exercises. I begin my day in a relaxed state of mind, which increases the prospect of a positive day and the ability to make the right decisions. The alternative is to jump up out of bed, rush in the shower, grab a coffee, wolf it down, quickly brush your teeth, jump in your car and rush to work, glancing nervously at your watch and worrying. Sound familiar? In that scenario, the slightest mishap is ready to send you over the edge. I want you to try my breathing exercise below for 10 minutes every day. Starting position – Lie on your back with your head and arms on the floor, your legs flat on the floor, or your feet flat on the floor, hip-width apart and knees bent. One other alternative leg position, which I favor, is with the soles of the feet pressed together and the knees dropping towards the floor, known as The Goddess Pose in yoga or Frogs in dancing. Close your eyes. If you like, place an eye pad over them and place one palm on your bellybutton and one palm on your chest. Set your alarm for 10 minutes. Inhale to a rhythmic count of four. The lower edge of the ribcage should expand, the abdomen should rise, and the chest and upper back should expand. As you exhale to a rhythmic count of four, the opposite should occur as you return to the starting position. At any point, if you become aware that your mind has wandered, gently draw your attention back to the breath and counting, this also helps focus the mind and frees you from distractions. Note: You can do this exercise at any point of the day. If you are in a stressful situation, go and find a quiet corner on your own, sit down and do some breathing. You’ll be amazed at how much calmer and better you feel. Often the thing stressing you out in the first place goes away, too. Try this exercise and let me know how it goes.